Ban Ki-moon, the former United Nations chief, returned on Thursday to his native South Korea, landing in the middle of an increasingly heated battle to succeed the nation’s recently impeached president. After leading the polls for months, Mr. Ban’s support has eroded due to perceptions his policies would be aligned with President Park Geun-hye’s graft-tainted administration. Mr. Ban, who hasn’t officially declared his candidacy, said he would make a decision on his political future soon, and that the decision wouldn’t be made for personal gain. Ahead of his return home in recent weeks, Mr. Ban’s rivals have been sniping at him, exploiting a perception that he Is an elite old-guard bureaucrat, out of touch with voter grievances such as corruption, slowing economic growth, youth unemployment and the power of the country’s conglomerates. Such concerns sparked mass demonstrations late last year. The New York indictment of Mr. Ban’s brother and nephew in a foreign-bribery case on Tuesday risks further harming his candidacy, even though Mr. Ban himself has no ties to the case. In his remarks Thursday, Mr. Ban said that he had dedicated his life to public service. “I have nothing to be ashamed of,” he said. Underscoring his ties to South Korea’s political elite, Mr. Ban is set to receive the Order of Civil Merit, one of the country’s highest civilian honors. Mr. Ban’s spokespeople didn’t respond to requests for comment. The country’s Constitutional Court must decide within weeks whether to remove Ms. Park from office. The snap election that such a decision would trigger has sparked a full-on campaign by South Korea’s leading presidential candidates. Mr. Ban, whose decade as secretary-general of the U.N. ended in December, enjoyed 28% support as recently as August, according to polling data from Gallup Korea. That sunk to about 20% in December, about on par with both Moon Jae-in, a leader of the opposition Democratic Party who lost narrowly to Ms. Park in the 2012 election, and Lee Jae-myung, the mayor of a satellite city of Seoul, whose support has surged in recent weeks. Still, political analysts say a splintered left-leaning opposition could give Mr. Ban an opportunity to win an election with a plurality of votes. Ms. Park’s impeachment, the result of an influence-peddling scandal, has inflamed anger against the conglomerates that dominate South Korea’s economy and the traditional political class, casting doubt over many of Ms. Park’s signature policies. Those include Ms. Park’s decision to deploy a controversial U.S.-built missile-defense system on South Korean soil to protect against North Korean threats, and a deal she struck with Japan to settle issues related to Korean women forced into sexual service for Japanese soldiers during World War II. Souring public opinion against the “comfort women” deal, which didn’t include consultations with the handful of survivors, has already sparked criticism of Mr. Ban for his praise of the agreement while at the U.N. The other leading candidates have repudiated the agreement. The New York indictment of Mr. Ban’s brother and nephew makes him “a much less attractive candidate,” Scott Seaman, an analyst with Eurasia Group in Washington, wrote in a note to clients. US prosecutors have charged relatives of former UN Secretary General Ban Ki-moon with conspiracy to bribe a government official. Mr Ban's younger brother and his nephew stand accused of offering money to a Middle Eastern official, through an American middleman. They allege the two men bribed the official to use state funds to buy their building project. 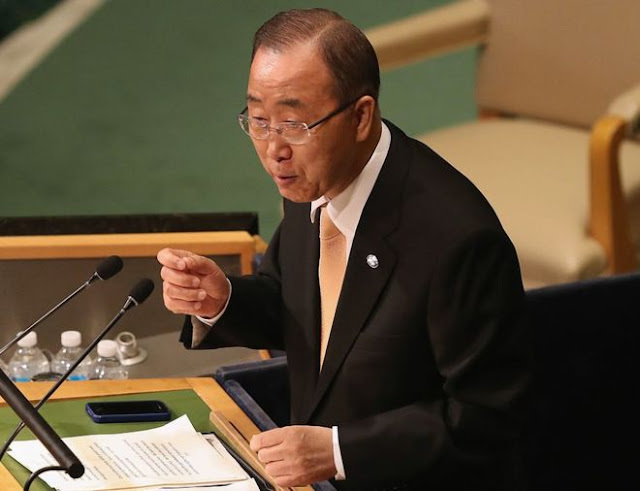 Mr Ban served as UN secretary general from 2007 until 2016. He was succeeded by former Portuguese Prime Minister Antonio Guterres on 1 January 2017. Mr Ban is now being seen as a possible future president in his home country of South Korea. Reuters quoted his spokesman as saying Mr Ban was unaware of the circumstances surrounding the allegations against his relatives. Prosecutors say that in early 2013 the South Korean construction firm Keangnam, of which Mr Ban's brother Ban Ki-sang was an executive, was faced with growing debt and sought to sell a building complex in Vietnam known as Landmark 72. In a 39-page indictment unsealed on Tuesday at a Manhattan courthouse, prosecutors alleged that he and his son Joo Hyan "Dennis" Bahn, a Manhattan estate agent, stood to make millions of dollars in commission on the sale, valued at up to $800m (£657m). US officials say that the two men paid millions of dollars in bribes and tried to trade on the prominence of their South Korean family name in order to persuade a Middle Eastern official from an unnamed country to arrange a purchase of the complex by that country's sovereign wealth fund. Federal papers say the two even tried to secure a meeting to discuss the deal with that country's head of state during his visit to New York during an annual UN general assembly meeting. Mr Bahn, who has pleaded not guilty, was released on bail. According to the indictment, a $500,000 initial bribe was paid to US businessman Malcolm Harris who presented himself as an agent of the official, with another $2m promised upon the closing of the sale. But Mr Harris allegedly double-crossed Mr Bahn and his father and made off with the money. Neither Mr Harris nor Mr Ban Ki-sang have been detained. "This alleged bribery and fraud scheme offends all who believe in honest and transparent business," said US Attorney for the Southern District of New York Preet Bharara, "and it stands as a reminder that those who bring international corruption to New York City, as alleged here, will face the scrutiny of American law enforcement." Mr Ban's relatives are charged with corruption, money laundering and conspiracy. Former U.N. chief Ban Ki-moon arrived home in South Korea on Thursday and said he will make a decision soon on his political career, amid expectations he will run in an election that may come early if President Park Geun-hye is forced from office. Ban, 72 is among front-runners in polls to succeed Park, whose fate will be decided when the Constitutional Court decides whether or not to uphold parliament's December impeachment of her over an influence-peddling scandal. Ban, a former foreign minister whose 10 years as U.N. secretary-general ended in December, has not said whether he will run for president, nor has he affiliated himself with any party. "I've been saying I will listen to our people's thoughts after returning home. I will have that opportunity from tomorrow. I will make a selfless decision with a humble heart," Ban said at the airport after his arrival. "That decision-making won't take long." Ban's possible path to the presidency hit a bump this week when his younger brother, Ban Ki-sang, and nephew, Joo Hyun Bahn, were accused in a Manhattan federal court of a scheme to bribe a Middle Eastern official in connection with the attempted $800 million sale of a building complex in Vietnam. Ban told Korean reporters in New York on Wednesday, before his departure for South Korea, that he was dismayed by the affair and had no knowledge of it. "I am perplexed and embarrassed that close members of my family have become involved in something like this. I feel it is regrettable the situation has troubled many," Ban said. "I had absolutely no knowledge. My nephew is grown and I barely had any involvement in his life or how he does business," Ban, who was not mentioned in the indictment, said in remarks broadcast on South Korean TV. Throngs of media and well-wishers, some carrying signs saying B.I.G., the acronym for a fan club, Ban Ki-moon Infinite Good Fortune, greeted him at the airport. "Thank you! Thank you!" a smiling Ban said as some in the crowd shouted his name. Ban picked up a baby dressed in traditional Korean hanbok clothing. Ban returns to a country gripped by political crisis stemming from the influence-peddling scandal that has engulfed the political elite. Park, 64, the daughter of a former military ruler, has denied any wrongdoing but was stripped of her presidential powers pending the court decision on whether or not to uphold her impeachment. If it does, Park would become South Korea's first democratically elected leader to leave office in disgrace and an election would be held in two months. As is, the scheduled date of the next election for a five-year single term is Dec. 20. While Ban was greeting supporters, Jay Y. Lee, scion of the Samsung Group, the country's biggest conglomerate, was being questioned by special prosecutors on suspicion of bribery in the wide-reaching scandal. Prosecutors are investigating whether Samsung gave about $25 million to a business and foundations backed by a friend of Park's in exchange for the national pension fund's support for a 2015 merger of two Samsung affiliates. Lee in December denied accusations the conglomerate sought to curry favour with Park or her friend to secure the merger. The political crisis has seen big peaceful protests every weekend, with demonstrators calling for Park to step down. "History will remember the year of 2016," said Ban, who before the political scandal had been expected to run as a member of Park's conservative Saenuri party. "It will remember a miracle, made by the people in the public square, good people united to make a good country," Ban said before heading in to central Seoul on the airport train. 0 Response to "Ban Ki-moon Returns to South Korea in Bid to Lead It"